Հիմնական » HAPPY 8TH OF MARCH! » Հայտարարություններ » HAPPY 8TH OF MARCH! Dear ladies, YSU Ijevan Branch cordially congratulates you on the International Women’s Day of March 8, wishing you good luck and happiness. Want to do your own weather always spring, and smile to outshine the sun. With the wonderful spring holiday, we congratulate you, wishing health, happiness and love and let the sun shine on you, and the birds are singing happily, let your house will reign, fun, peace, warmth and comfort. Originally known as International Working Women’s Day, its roots lie in the socialist, rather than feminist, struggle of the early 20th century. Although national days had been celebrated prior to 1911, the 18 March of that year marked the first International day, following a proposal from German communist Clara Zetkin. The earliest Women’s Day observance, called “National Woman’s Day”, was held on February 28, 1909, in New York, organized by the Socialist Party of America at the suggestion of Theresa Malkiel. Though there have been claims that the day was commemorating a protest by women garment workers in New York on March 8, 1857, researchers have described this as a myth. International Women’s Day was first celebrated on March 19 (not the later March 8), 1911. The idea of an International Women’s Day was inspired by America’s National Women’s Day, February 28, 1909, declared by the Socialist Party of America. The next year, the Socialist International met in Denmark and delegates approved the idea of an International Women’s Day. And so the next year, the first International Women’s Day — or as it was first called, International Working Women’s Day — was celebrated with rallies in Denmark, Germany, Switzerland, and Austria. Celebrations often included marches and other demonstrations. The first Russian observance of International Women’s Day was in February 1913. In the West, International Women’s Day was first observed as a popular event after 1977 when the United Nations General Assembly invited member states to proclaim March 8 as the UN Day for women’s rights and world peace. 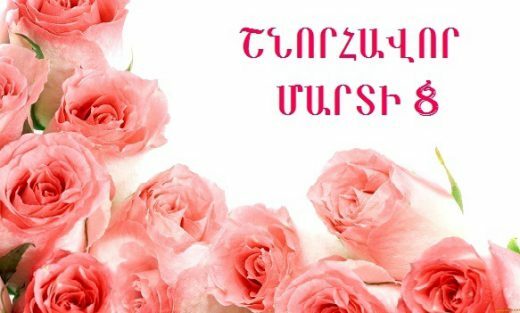 In Armenia, after the Independence, there were attempts to remove March 8 from the list of holiday and instead create a new one – April 7, Day of Mothers and Beauty. Nevertheless, March 8 had such deep roots in our society that March 8 – April 7 is now non-officially announced to be women’s months.